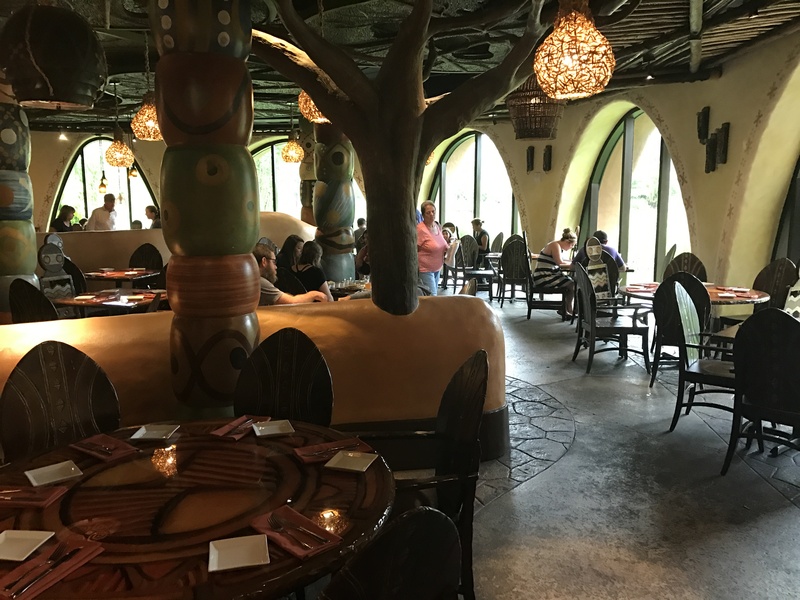 After an eventful morning at the Animal Kingdom park we left shortly after noon to try to make our lunch reservation at a new place we had never been to before. 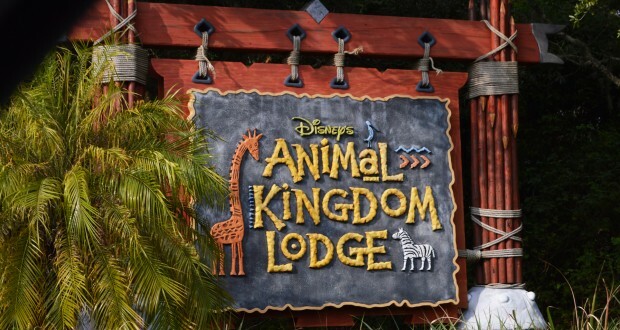 We left the parking lot and just a short drive away we drove up to the Animal Kingdom Lodge. The security guard at the gat was very nice in explaining where we needed to go. After parking the car we headed inside and were just blown away with this resort. The details they included here are really amazing, and towards the back of the lobby were huge windows giving you a fantastic view of the Savanna the resort surrounds. 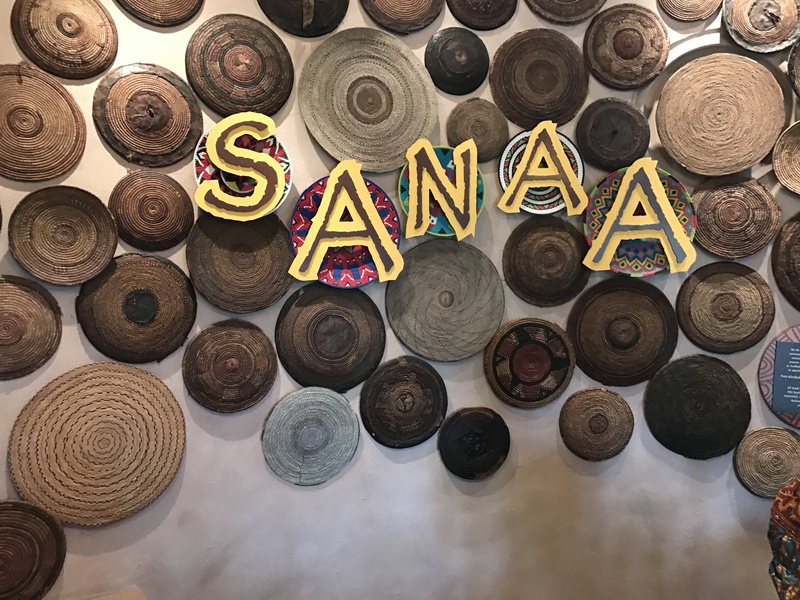 We took the staircase down one level and found the restaurant lunch Sanaa which I have been wanting to try for a while and have heard nothing but great things about. After a few minutes wait while they got our table ready we were given a tour of the restaurant on our way to the table. 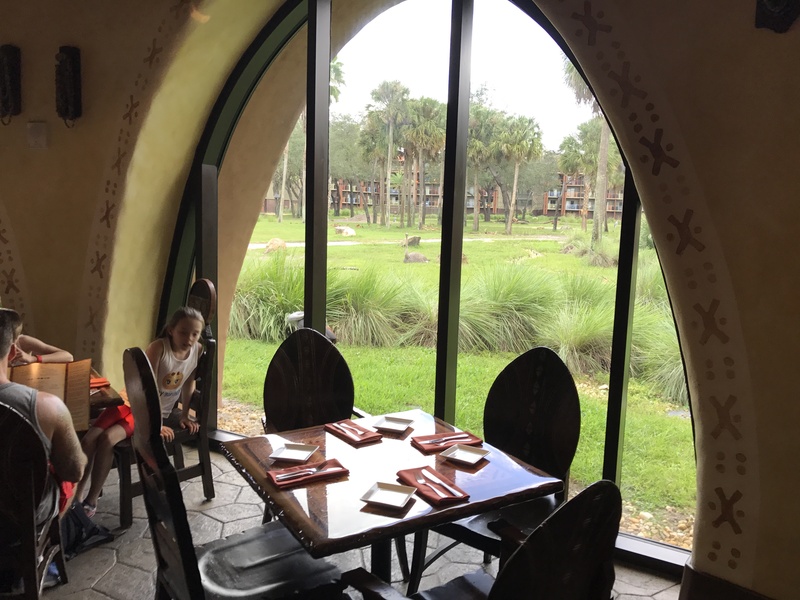 There were some tables right up near the large windows to look out at the Savanna, but unfortunately our group was too large and weren’t able to get one of these tables. But regardless there are fantastic views from pretty much every table inside. Throughout our meal we were able to see various animals, and birds come right passed the windows which makes this a unique dining experience. The food is definitely not what we are used to eating but was still excellent. The Indian-style bread service appetizer was the most talked about. 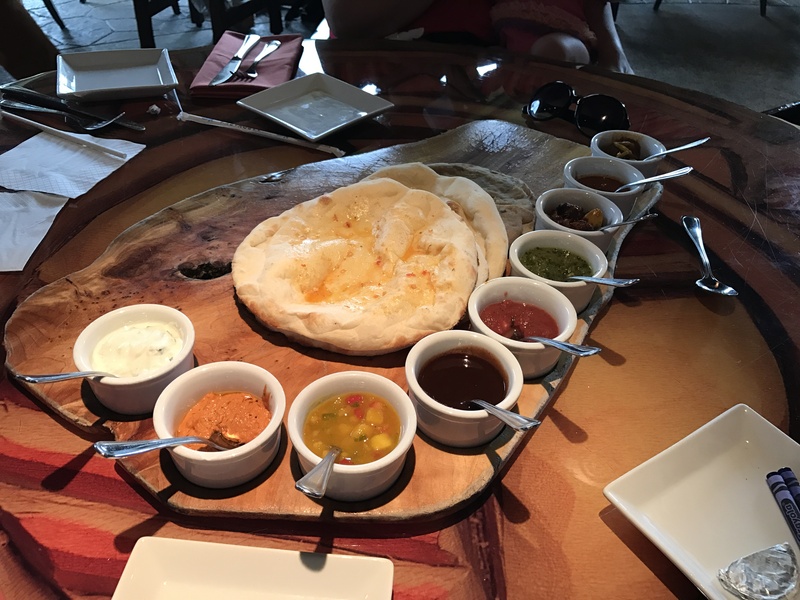 We opted for the full tasting option which included 5 different naan breads, and 9 different sauces/accompaniments. This was our chance to try something outside our comfort zone but not be too crazy and this was really a great find and experience. Weeks after our vacation was over this was the one place we all kept talking about. It’s not necessarily the easiest place to get to if you aren’t staying at this resort, but that’s what makes this a hidden gem and well worth the extra time to get there. After lunch we did spend a little time wandering around the resort and came to a conclusion that we were going to try to stay here on an upcoming trip. 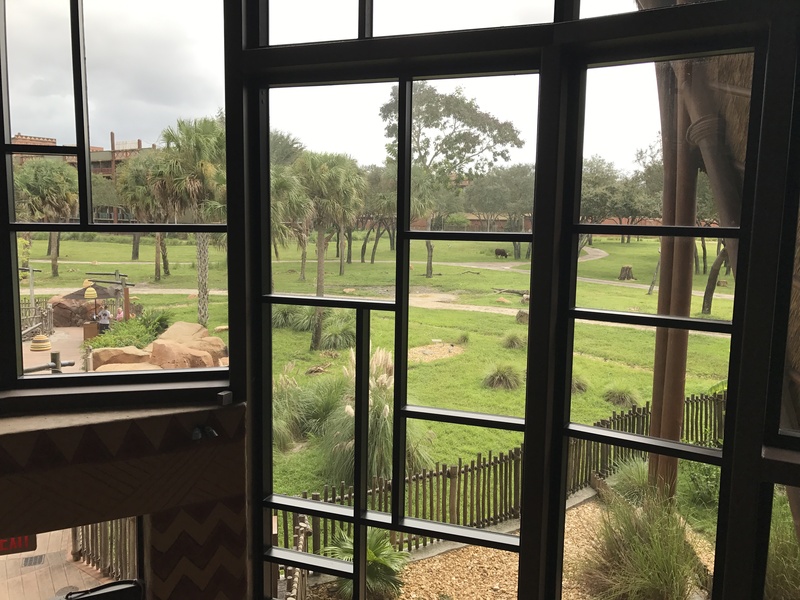 I can only imagine how cool the rooms are, especially if you get one that looks out over the savanna. Eventually we got back to our car, but didn’t want to got back to our resort right away. I mentioned checking our another resort The Art of Animation which is a value resort but with really nice theming. Last year I made a trip myself over to this resort to check it out and wrote about it here. 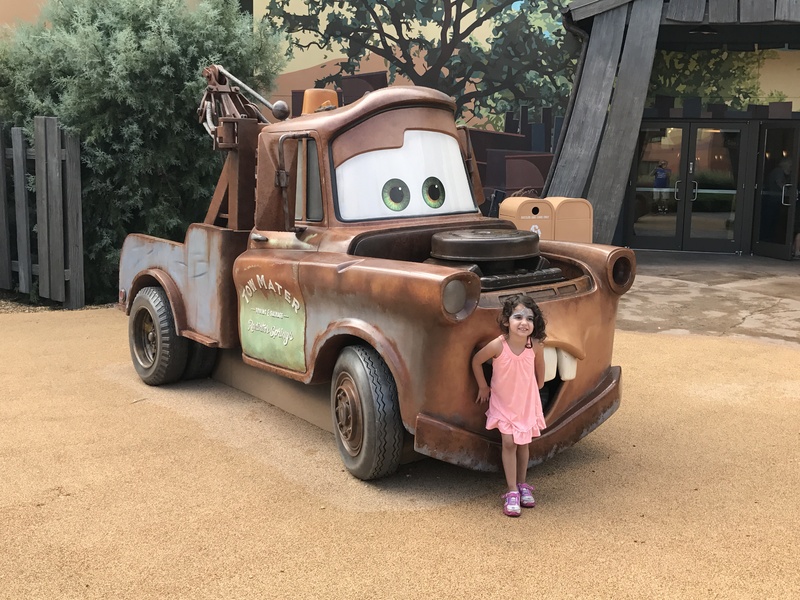 This time I wanted the rest of my family to check it out and Hanna really got a kick out of the Cars characters. When we were don’t walking around the resort we went back into the main building and got some drinks and snacks from their food court for the ride back. While we were inside I took the opportunity to update my pressed coins from this resort. Both these machines have some really detailed designs. 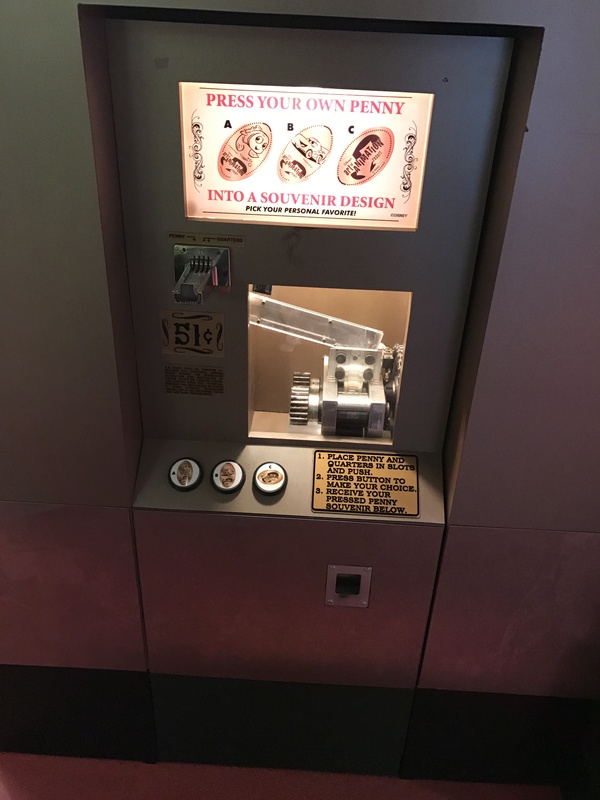 This first machine has pennies with images of Nemo, Lightning McQueen, and The Art of Animation Resort Logo. 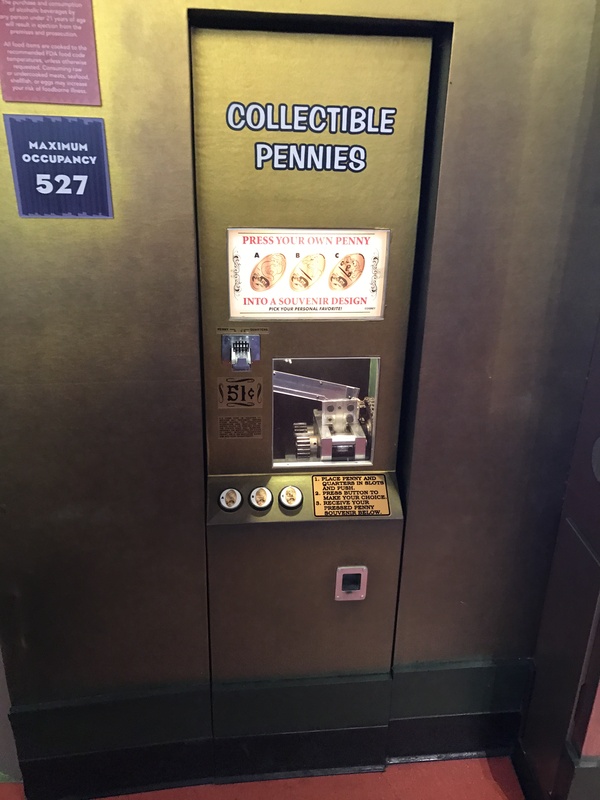 The second machine has pennies with designs of Ariel from The Little Mermaid, Simba from The Lion King, and Mater from Pixar’s Cars. By this time we were about ready for an afternoon nap. We headed back to our resort and took the rest of the afternoon off just to rest and recharge. 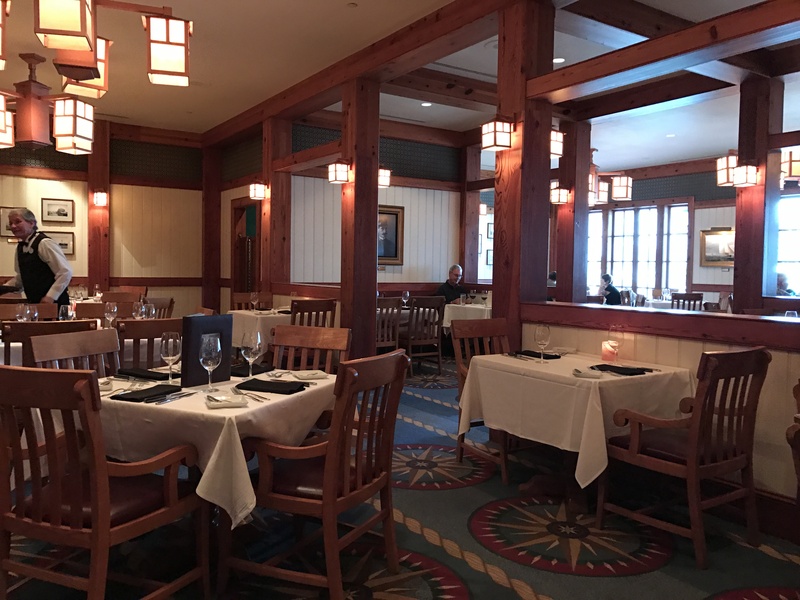 Our dinner reservation was later that evening but thankfully it was just over in the Yacht Club Resort which was just a short walk away. 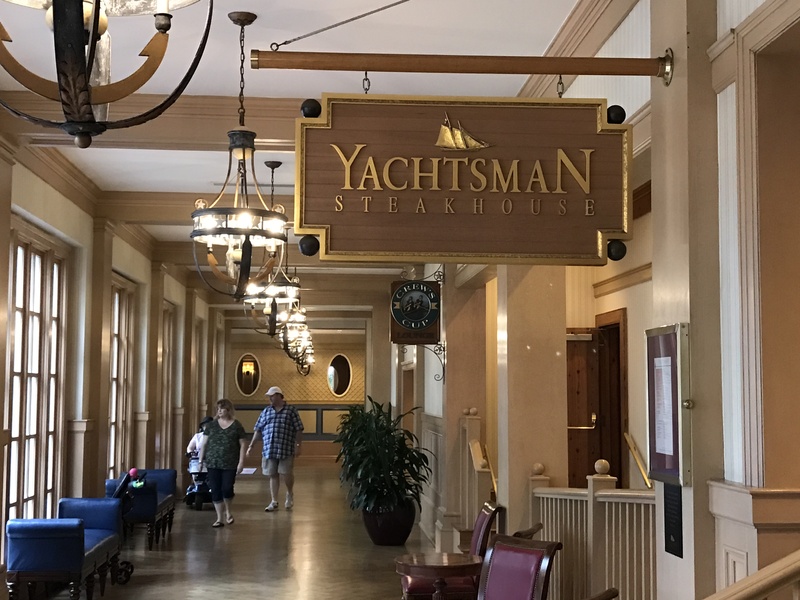 The Yachtsman Steakhouse was another fantastic meal. Coming from Jersey we have visited some really great Steakhouses in New York City, but this was really a nice find. 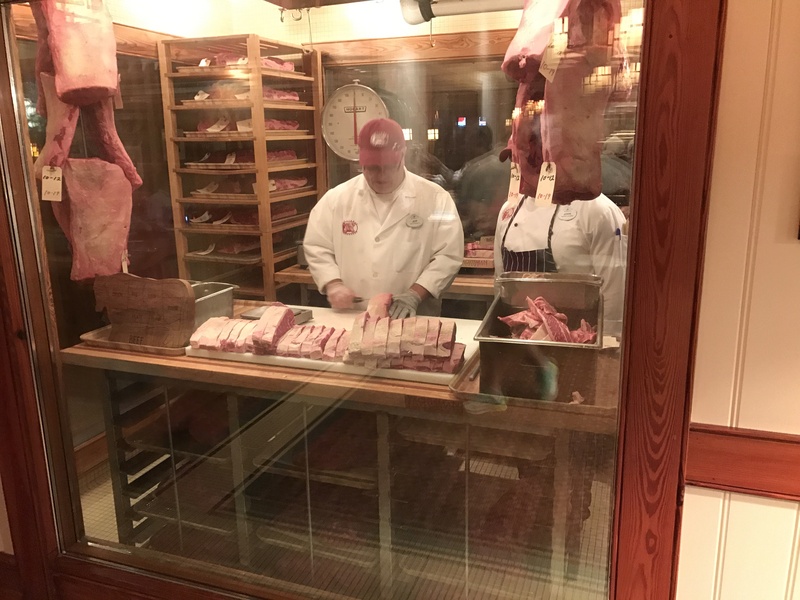 Upon entering the restaurant we passed by their meat aging room, which is also where they hand cut the different steaks. They do have an open kitchen so you can see everything going on, and the staff is very friendly and greeted us as we passed by. Our table was a little further back but our wait staff were fantastic. The food was also really top-notch, but please note that the price definitely reflects this. But we were so impressed with everything that we felt the cost was definitely justified. I started with a French Onion Soup which I have any time it’s on the menu. 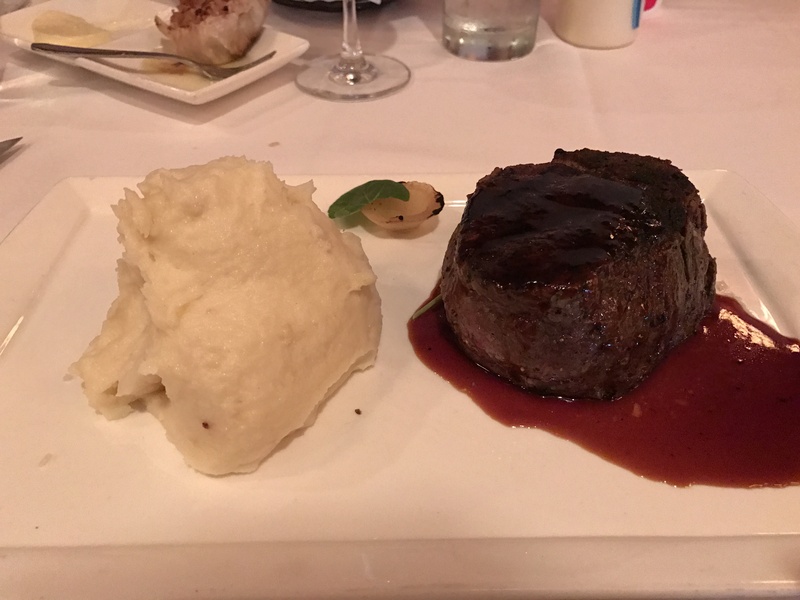 My main course was a 10 oz Black Angus Filet Mignon with mashed potatoes and a Cabernet wine sauce which is pictured above. When we were done it was a good thing our resort was a quick walk away. We were completely stuffed but the nice walk along the water helped our digestion. This has been a fun day filled with new adventures and new food favorites we would absolutely be trying again. Tomorrow was the Wedding Day so we made it an early night.